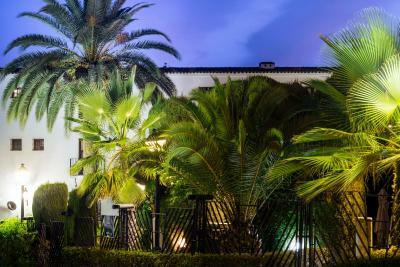 Lock in a great price for Parador de Mérida – rated 8.4 by recent guests! Location was perfect for our purpose of walking and exploring the sights. The historic building was gorgeous! The rooms was large and beautiful, well laid out, quiet. Good location for exploring the city. Parking available on site. Nice bed and good bathrooms. I loved the historic ambience. A great value for the price. I did get utterly lost in the hotel and came out at the back where a nice gardener had to lead me to the lobby so a few more directional signs in corridors and by elevators and stairs would be good. Very good food - a knockout tomato dish - cold gazpacho-type soup with chopped tomato and tomato ice cream with an anchovy atop. Sounds weird and it was completely, totally wonderful. You can order it without the anchovy if you prefer, but the combination of slightly sweet and slightly salty (these are very mild brine-marinated bocarrones, not the greasy, dark, oil-soaked pizza anchovies) was stupendous. 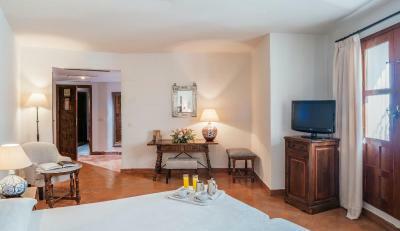 Spacious rooms, nice setting and excellent breakfast. Rooms are tidy. 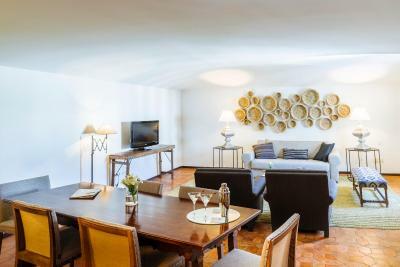 Excellently located in the city centre. 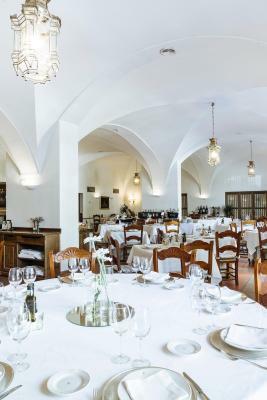 Staying at the Paradores, and enjoying their history, is part of the travel and sightseeing experience of going to Spain for us. 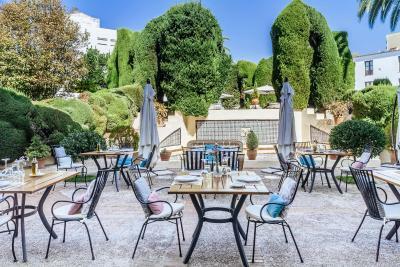 This property had an excellent location, parking, fantastic service, great rooms and baths, and a delicious breakfast. Highly recommend! The hotel is beautifully decorated. No plastic electronic keys— a real brass key that opened a carved wooden door. 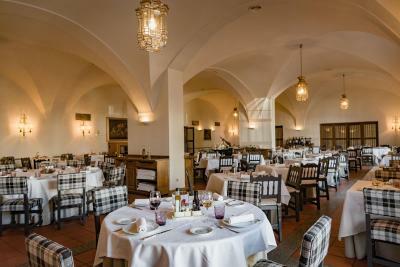 Everything about the Parador was amazing. The location couldn't have been better. Felt like home away from home. Overall, the hotel was wonderful. 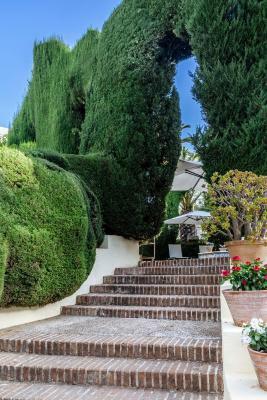 It´s in the old spanish style, inside and out, very clean. Our room was quiet and spacious with a balcony looking out over a garden. The bathroom was large and clean. The food was great, especially the ample breakfast. 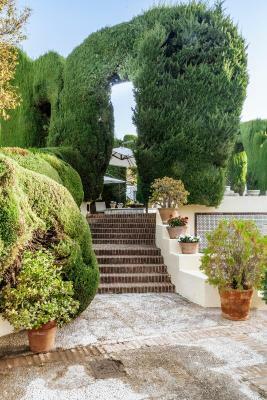 _The Parador is well located, about 20 mins. walking (at my slow pace) from most of the ruins and museums. We were able to park in the garage under the hotel. Space is limited to maybe 25-30 cars. We went in mid-May which means there are less tourists about than in June - August. Temperatures were great, neither hot nor cold. 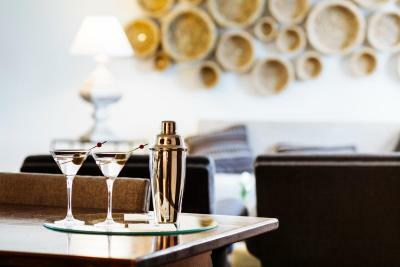 Very comfortable bed, great food in the restaurant, most of the staff friendly. 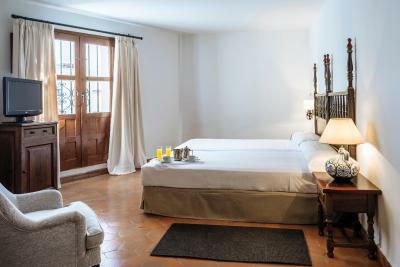 Parador de Mérida This rating is a reflection of how the property compares to the industry standard when it comes to price, facilities and services available. It's based on a self-evaluation by the property. Use this rating to help choose your stay! 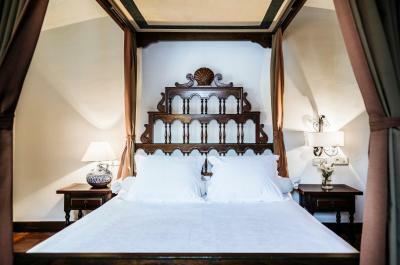 One of our top picks in Mérida.Set in a former convent, dating from the 18th century, the Parador de Mérida provides attractive accommodations. 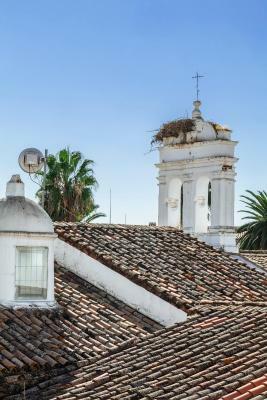 It is within 10 minutes' walk of Mérida's main attractions. 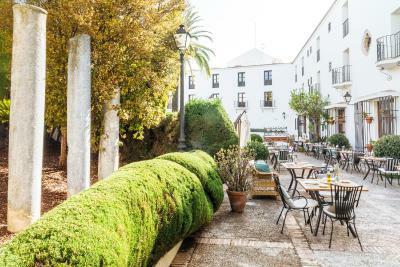 Parador de Mérida features a pleasant, traditional-style inner courtyard and beautiful gardens, where you can relax and read a book and keep cool in the midday sun. 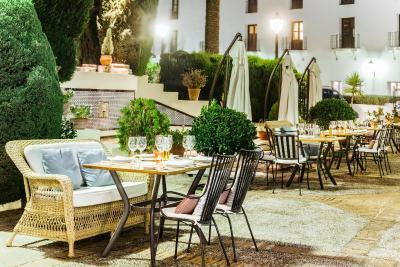 Dine in the Marmitia on-site restaurant with family or friends, where you can enjoy local-style cuisine, without leaving the hotel. 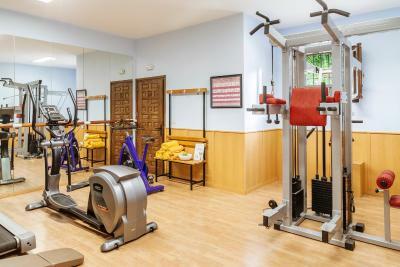 There is a sauna and a gym in the Parador de Mérida, where you can do some exercise. 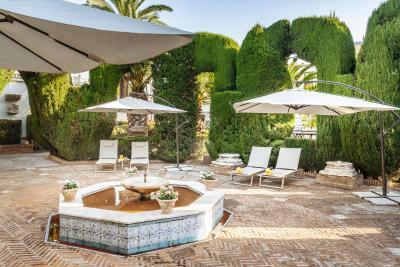 Then you can take a dip in the outdoor swimming pool, or simply lie back in the sun on one of the sun loungers. The Roman Bridge is 2,950 feet from the property while Diana Roman Temple is 1,000 feet walk away. Sevilla San Pablo Airport is 122 mi away. 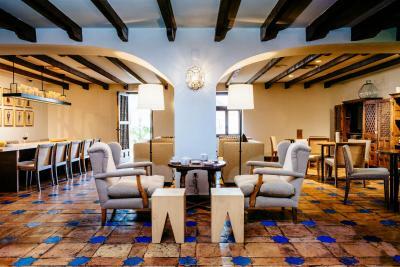 When would you like to stay at Parador de Mérida? 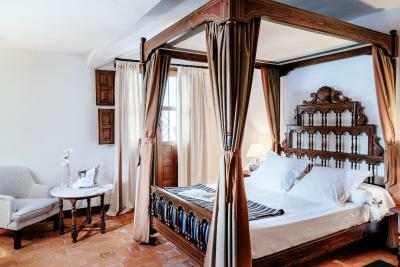 This elegant room features a Castilian-style décor and is equipped with a flat-screen satellite TV, mini bar and safe. 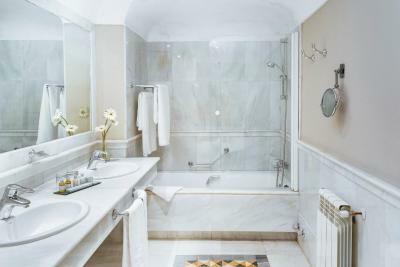 The private bathroom with bath tub and shower includes toiletries and a hairdryer. 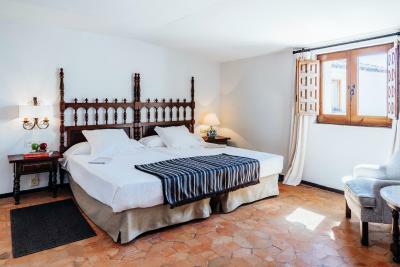 This twin/double room features a mini-bar, tile/marble floor and air conditioning. 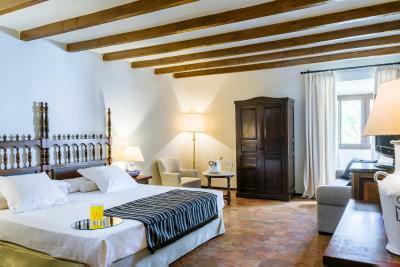 This bigger double room features air conditioning, Nespresso, mini-bar and tile/marble floor. 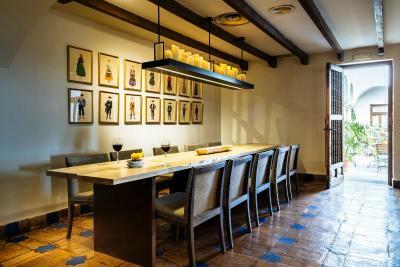 Please note that each room features different décor and they will be assigned subject to availability. 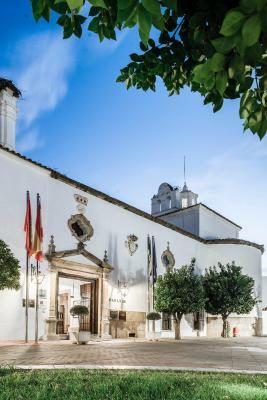 The hotel is a former 18th-century convent built atop the remains of a temple dedicated to the Augustan Concord. 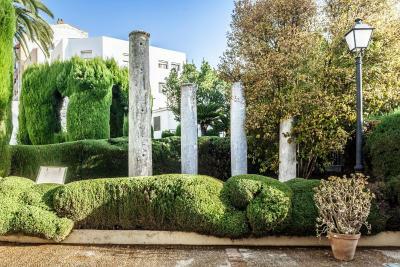 It is the perfect combination of tradition, comfort and good service, from which you can explore Roman, Visigoth and Arab Mérida, as well as the modern, contemporary city. 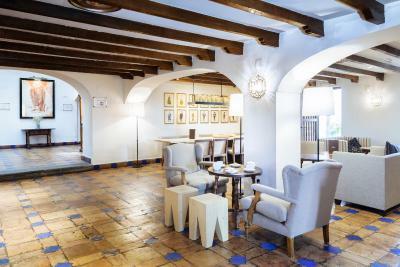 House Rules Parador de Mérida takes special requests – add in the next step! 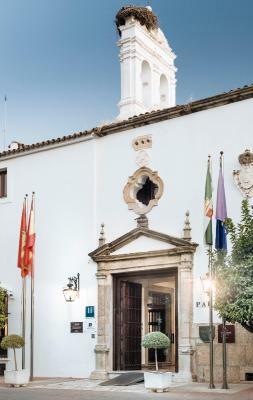 Parador de Mérida accepts these cards and reserves the right to temporarily hold an amount prior to arrival. Air conditioning did not work, safe did not work, sink in bathroom drained sliw. The thermostat was either not working or...? We could not really cool off the room to our liking for sleep. We opened the window and that helped. 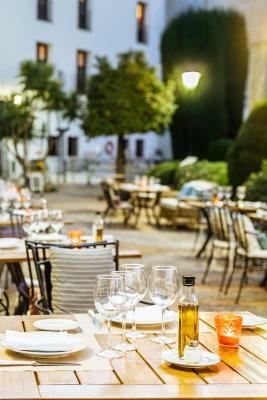 The restaurante service and the food are simply awful. Tasteless and raw dishes, everything takes forever to be brought to you, very little variety... not worth the money. Do not pay for breakfast or to have any kind of meal at the hotel. The room was pretty big and clean. The bathroom was huge. Space is definitely not a problem at this property. Walls are a bit thin, easy to hear people in the rooms around you and street noise. Kind of annoying to pay for parking when it belongs to the hotel and I am already paying for a room. Very gloomy inside the hotel. Breakfast is quite expensive given the choice offered. The only negative note is the back garden/parking area. It’s a pity that the garden is not really used and the parking takes so much space. The bar cheeper has been very unfriendly. Nice historic building, nice commons areas and very nice forniture. Big room with balcony facing the back garden/parking area. Bathroom very clean and comfortable. At breakfast the water for tea not hot enough. Plug socket in room 208 did not work and was dangerous with 3 plugs attached from adaptor. I couldn't sleep after 4am because I could hear a baby crying in the room next to ours like he was in our room! No wifi in the room, expensive parking charge. You could hear people walking above us and in the Hallway. The hotel was lovely and the location what great. The room temperature was 25,6 degrees Celsius. Due to the heater being on, the A/C was not possible to be turned on, according to the staff. To decrease the room temperature the advise was to open the windows. Te noise from the traffic outside disturbed the sleep. The parking fee was not included and was an extra charge.